Joining the DHPC you have three membership options: Full Membership (£20) or Limited Membership (£5) and Limited Membership Powered (£5). Allows Full Members (with the required BHPA pilot rating) to fly all our sites; Dunstable Downs, Sharpenhoe, Chinnor and Holmbeck Farm. All Full Members are required to pass the Airspace Briefing before flying at Dunstable Downs. Pilots must have a BHPA Club Pilot (Hill) rating minimum. Note: If you chose to pay your Membership by Direct Debit ONLY the subscription is reduced to £18 per year. Allows Limited Members (with the required BHPA pilot rating) to fly at Sharpenhoe and Chinnor - BUT NOT AT DUNSTABLE DOWNS. Limited Members do NOT require the Airspace Briefing. IMPORTANT: Limited Membership is ONLY available to pilots with a BHPA Pilot (Hill) rating or above. 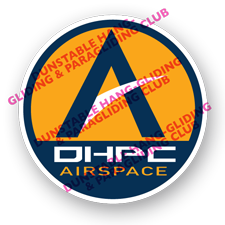 Allows Powered Hang-glider/Paraglider pilots to join the DHPC who wish to fly at Holmbeck Farm ONLY. You cannot free-fly an unpowered PG/HG at any of our Hill sites. Powered Limited Members do NOT require the Airspace Briefing. Powered Pilots must have BHPA Club Pilot (Power) rating minimum. Join the DHPC via 'WebCollect' (Membership and Events management website) by clicking the button below and Sign-in to WebCollect. You will need to Sign-up for an account if you have never used WebCollect before. When completed, you will be able to sign-in to your account using your email and chosen password. Please remember your chosen password, you will need it to sign-in to WebCollect to renew your membership each year! The handy feature of WebCollect is that you only have to sign in once to your account, and then you can access multiple flying clubs to join, like the Thames Valley or S.E. Wales Club, so you need to only remember one password! New members that join in the last three months of the DHPC membership year (1st January onwards) will have their memberships carried forward to the following year, effectively giving you up to 15 months membership for the price of 12. Pay your yearly membership subscription (due on the 1st April) by clicking on the button below. Sign-in to your existing WebCollect account by using your original email & chosen password, check that your personal details are still up-to-date, and then select the appropriate Membership subscription. If you have forgotten your Password, just go to the sign-in page on WebCollect and then click on 'Reset my password' and reset it. Then make sure you remember it this time! If you pay via Direct Debit: As your Club Membership subscription is paid by Direct Debit, your Bank will automatically pay your yearly subscription on or around the 1st April each year. You do not have to set up another Direct Debit each year. However, if your pay either via Bank Transfer, PayPal, Credit or Debit Card, or Cheque, you must pay your membership fee every year when the subscription is due, on or before the 1st April. Our sites have strict rules regarding the experience of club members flying them. All Members must be a minimum of BHPA Club Pilot (Hill) Rated, and they will be issued with a lifetime helmet Airspace Sticker (BEFORE flying at Dunstable Downs for the first time) to show that they have completed the mandatory Airspace Briefing. All Members must be a minimum of BHPA Pilot (Hill) Rated and should receive a site briefing from a DHPC Club member before flying for the first time. Both these sites are technically difficult to fly and therefore we have limited them to (P) Pilot rated members only. Holmbeck Farm is a private airfield for Powered Paragliders & Hang-gliders. Members must be a minimum of BHPA Club Pilot (Power) rated and should receive an airfield briefing from a DHPC club member or the airfield owner before flying at this airfield. Full Members (£20) - an Airspace Briefing is required before you can fly at Dunstable Downs. Limited Members (£5) do NOT require the Briefing. Full Members who wish to fly at Dunstable Downs, must attend the mandatory Airspace Briefing with the Senior Coach BEFORE flying at the Downs for the first time. Upon completion, pilots are issued with a lifetime Airspace Sticker that must be displayed on your flying helmet. Airspace Briefings are organised once a month on weekend mornings (and summer evenings by individual agreement), as notified opposite. In exceptional circumstances, if you cannot make the monthly organised briefing date, you can arrange an individual weekend briefing by clicking the Registration button below. If you're attending the Briefing, meet at the main entrance to the Chiltern Gateway Centre on Dunstable Downs. (satnav: LU6 2GY) There is ample parking. Please make sure you bring your BHPA and DHPC Membership Cards with you (and a pen). If you would like to attend the next monthly Briefing, click on the button below and state your full name and BHPA number by email. If we do not get any pilots registering, the Briefing will usually be cancelled the day before. Note: Airspace Briefings are now only being held on the scheduled monthly dates as shown. All Club memberships run from the 1st April to 31st March every year. Therefore, everyone should renew their membership subscription before the 1st April. Upon renewing you will receive your new Membership Card which you should have on you at all times when flying any of our sites. If you intend paying you DHPC subscription by Direct Debit can you please set your payment date on or before the 1st April. IMPORTANT NOTE: If you are a NEW Member joining the Club for the first time between the 1st January and the 31st March - see opposite. For example: if you join the Club on the 1st January 2019, your Club Membership expires on the 31st March 2020. Your yearly Club Membership Card also has your membership expiry date printed on it to remind you. Choose from the following options for paying your club subscription on WebCollect. PayPal: you can pay online using your PayPal account, Full Membership £20 or Limited Membership £5. Credit Card / Debit Card: you can pay online with your Debit or Credit Card via the PayPal button. Full Membership £20 or Limited Membership £5. Bank Transfer: you can pay online by Bank Transfer. Full Membership £20 or Limited Membership £5. Direct Debit (£18): you can pay by setting up a Direct Debit for £18 (Full Membership). There is a £2 discount for paying Full Membership via Direct Debit, unfortunately there is no discount for Limited Memberships. Cheque: you can pay by sending a Cheque (made payable to the DHPC) to the DHPC Membership Secretary (see address opposite). Please pay by selecting the PayPal option on WebCollect. You then have a choice whether to pay via your PayPal account or your Debit Card or Credit Card. Please pay by selecting the Bank Transfer option on WebCollect, You will be given the DHPC Account number and Sort code during the payment process. Please pay by selecting the Direct Debit option on WebCollect. This payment process is completed using the GoCardless payment system. Your subscription will renew automatically on the 1st April each year. Bank Transfers. These do not get paid automatically by your Bank, so you will have to remember to pay your Bank Transfer every year at the end of March. Direct Debits. Your Club Membership is paid automatically by your Bank and they will continue to pay your yearly Direct Debit subscription on or before the 1st April each year, until you notify your Bank to stop payment. You do not have to set up another Direct Debit every year.